That’s right! The title says tablecloth hammock. If you’re looking to make an easy cheap hammock, whether you’re just starting out & not sure if hammock camping is for you or have a gear closet full of hammocks — this is a great project to try. For newbies to hammock camping. These would be a great way to test the waters. 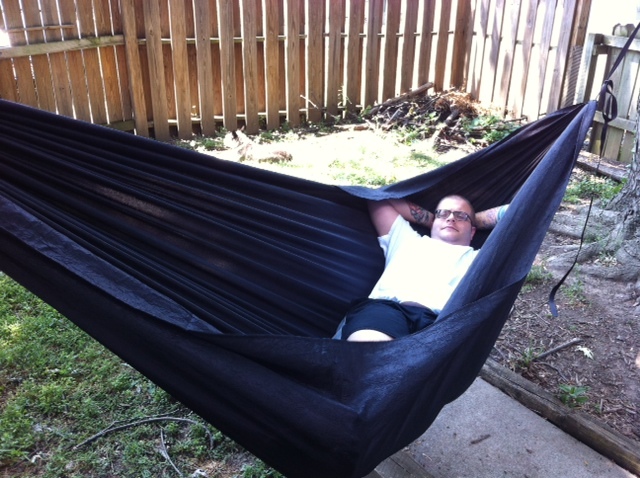 With very little to no sewing you can have a hammock put together in no time. Boy scouts? this is a great low budget project! Tendertoe just recently posted about his experience when making a DIY tablecloth hammock. I finally bit the bullet and picked up two crinkle taffeta tablecloths from Tableclothsfactory.com. I got a 60×126 and a 90×132 both in black. 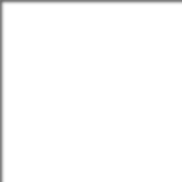 They are rectangular pieces of taffeta material that are hemmed on all sides. I sewed channels in both ends of both hammocks but you could just as easily whip them without sewing (IMHO channeled hammocks feel a bit more spacious). 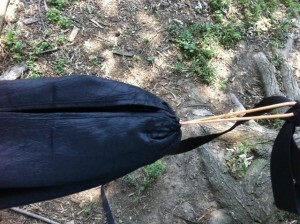 I lost about 5 total inches off both hammocks with the channels. 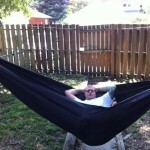 The 60″ wide hammock weighs 15.5 oz with 30 inch Dynaglide chainlinks. 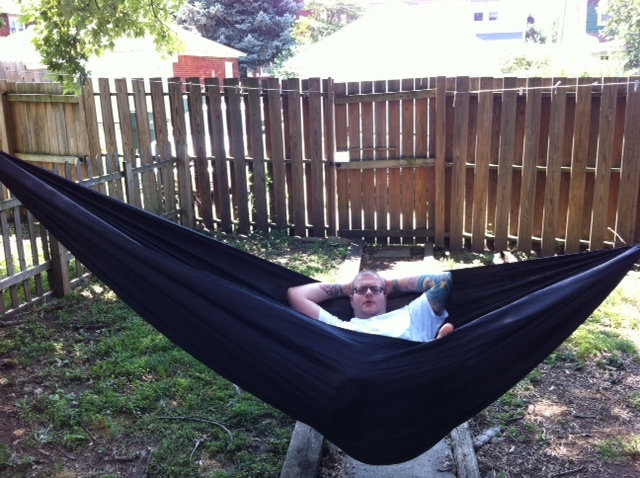 The 90″ wide hammock weighs 24.625 oz with 30 inch 7/64 Amsteel chainlinks. The feel of this taffeta is a bit “rougher/sturdier” than a 1.1/1.9 ripstop. It does “give” a bit more under you as well. I liken it a bit more to a parachute-type material in that it “gives” a bit under your weight (which I think actually “cradles” you a bit more than a ripstop would). All-in-all, a nice hammock. Has a flat lay – no calf ridge at different suspension angles/suspension tautness (which I attribute to the channeled ends). Well worth $12.99. I’m going to throw a bugnet together and this will be a nice go-to hammock. 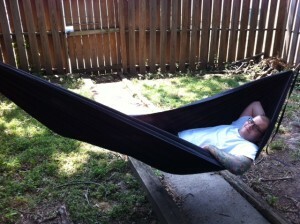 For a true “backyard” hammock, this is an AWESOME hammock. I’ve never been in a Mayan hammock but this is the most comfortable hammock I’ve ever felt. 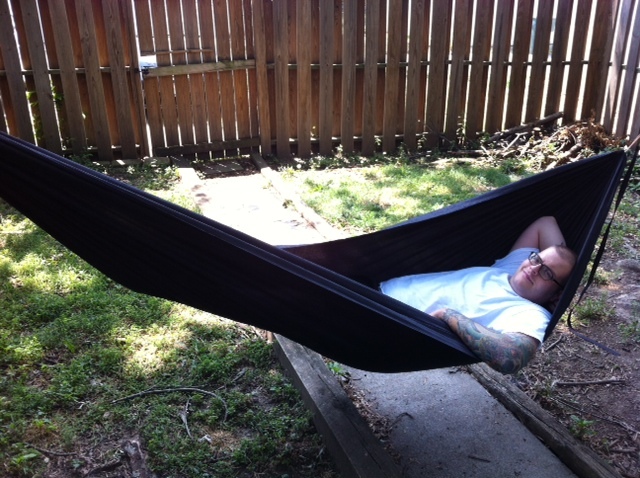 I’m 6’2” and am able to lay perpendicular in this hammock. Extremely comfy and spacious is an understatement. 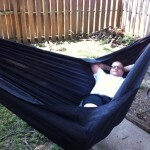 My total order was just under $30 shipped (10% off total order plus free shipping) for 2 hammocks. 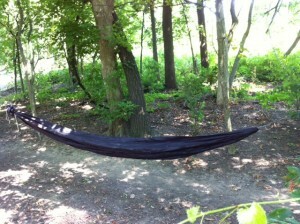 * editors note/addition: See Dutchware’s co-op store for complete hammock suspension solutions. Here’s the original thread on hammockforums.net where Tendertoe posted his review. Thanks to Tendertoe for posting a great review on the Tablecloth factory materials and illustrating how easy it is to put together a hammock. 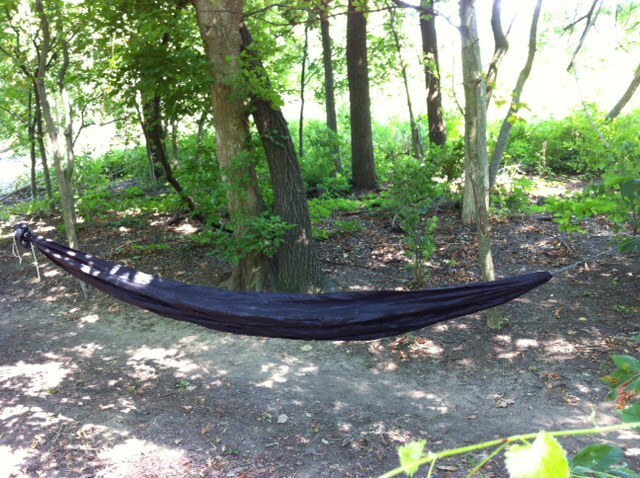 Get out in the woods & enjoy your new DIY tablecloth hammock!